« MySpace or Facebook for promoting local arts? Ronnie Jaggers, an Amplifier contributor for more than a decade with her featured artist column, took 3rd place in the sculpture category at the US Bank Celebration of the Arts exhibit. The show features 2 floors in WKU’s Kentucky Museum of regional artwork. An awards reception will be held Saturday February 26, 5-7 p.m. The exhibit will remain in place until April 4 at which time the winners will move to another exhibit in the Ervin Houchens Gallery in the Capitol Arts Center. 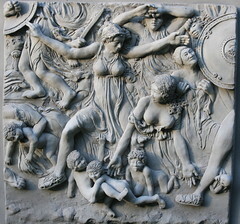 Ronnie’s piece, the Intervention of the Sabine Women, is an Alto Relief, 14″ x 14″, made of polymer clay. This will be her third time showing in the Capitol Arts Center in Bowling Green including a mask exhibit for the Bowling Green International Festival Gallery Walk in 2006 and an award winning piece in the Women in the Arts show last year. You can view more of Ronnie’s work online at www.ChiseledFeaturesStudio.com. This entry was posted on February 27, 2009 at 2:25 pm	and is filed under Arts. Tagged: amplifier, art, capitol arts center, celebration of the arts, chiseled features, houchens gallery, ronnie jaggers, sculpture, women in the arts. You can follow any responses to this entry through the RSS 2.0 feed. You can leave a response, or trackback from your own site. Congrats to Ronnnie! ^_^ That relief is beautiful. I love classical (Greek-ish) art. Topper’s Fine Line Tattoos inc. This is a message to the website creator. I came to your page via Google but it was difficult to find as you were not on the front page of search results. I know you could have more visitors to your site. I have found a website which offers to dramatically improve your website rankings and traffic to your website: http://bit.ly/WuJy6b I managed to get close to 1000 visitors/day using their services, you could also get a lot more targeted visitors from search engines than you have now. Their services brought significantly more traffic to my site. I hope this helps!